In a world awash with photos shared on social media, the potential for a Photoshopped image to misrepresent real life to a massive audience is greater than ever. To maintain integrity, news organisations have to police their own photographers, as well as authenticate pictures they source from the public. Using Photoshop to fake elements of an image can cost a news photographer their job, as freelancer Adnan Hajj found out in 2006 when Reuters discovered he had artificially exaggerated the dark smoke created by an Israeli airstrike on Beirut, Lebanon. 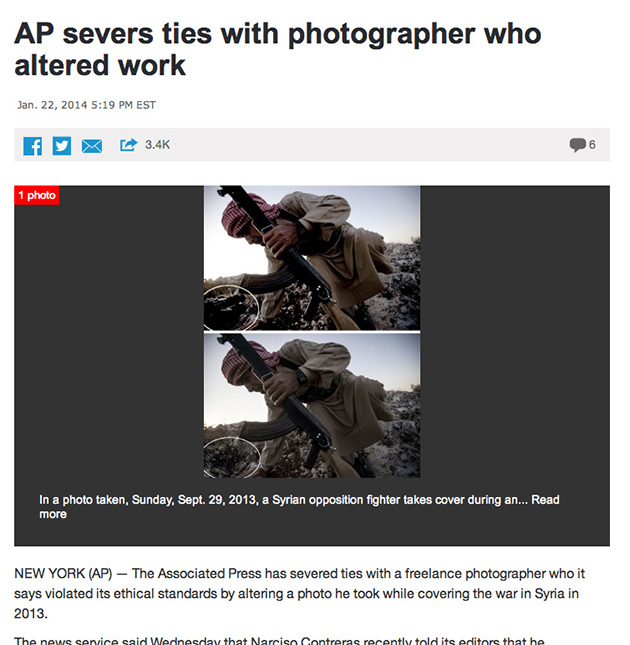 More recently, Associated Press severed ties with Narciso Contreras who had captured an image of a Syrian opposition fighter taking cover from government forces in a mountaintop village in 2013. The Mexican had used software to remove a journalist’s video camera in the corner of the frame – by cloning other pieces of the background and pasting them over the camera. The war photography faux pas involved only a corner of the image with little news importance, yet it violated the agency’s ethical standards and breached the agency’s call for truth and accuracy. Explaining his actions, the former Pulitzer Prize winner said he believed the video camera might ‘distract viewers’, adding that he regretted the decision and felt ashamed. By comparing different versions of the image, it could be seen how dark smoke was later added to the image, seemingly to add drama to the scene. Further editing took place before it was published, reportedly to remove a watch worn by one of the soldiers, because it was believed to have been looted. Yet, judging whether a Photoshopped image has altered the integrity of a shot is a subjective process, and may have been done with no intention to hoodwink the viewer. In 2009, a Ukrainian photographer defended digital manipulation of an image that led to his disqualification from the prestigious World Press Photo competition. Stepan Rudik, a winner in the Sports Features category, admitted to digitally removing part of a foot of a person seen in the background of one of his entries. World Press Photo has since tightened its rules – even commissioning a report into accepted manipulation standards across the industry – but it seems some photojournalists still struggle to distinguish good Photoshopping from bad, or are simply not listening. 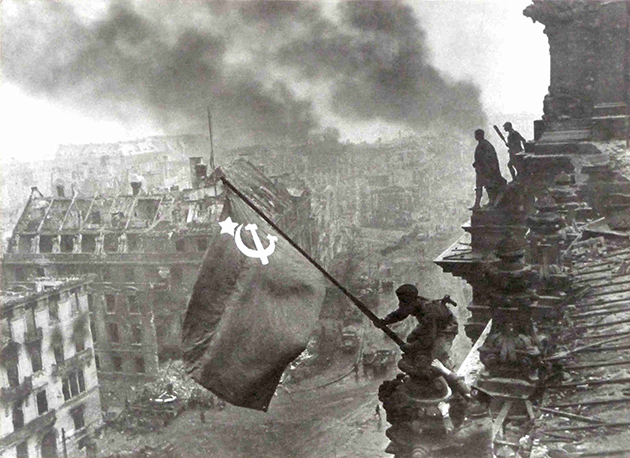 Last month, organisers were forced to prevent 20 photos from proceeding to the final round of its 2014 contest, after independent experts analysed all the image files of each suspect entry. Though World Press Photo believed there were ‘no attempts to deceive or mislead’, it said there was an ‘urgent need’ to create a ‘deeper understanding’ of issues that surround the application of post-processing standards in professional photojournalism. The more tranquil world of landscape photography has also been marred in controversy. The 2012 Landscape Photographer of the Year winner David Byrne was stripped of his title and £10,000 winnings after judges ruled he had used too much manipulation. Byrne said he did not read the rules, admitting he digitally added clouds and ‘cloned out small details’ on a black & white image of Lindisfarne Castle in Northumberland. At the time, the photographer insisted the changes were ‘not major’ and told AP he received many emailed messages of support since being disqualified. ‘I don’t feel I have done anything wrong with the photo – adding clouds and removing small boats from the harbour in the background was a natural thing to do in my eyes,’ he said. In the world of beauty, fashion and celebrity photography, Photoshop occupies a curious and unique dual space, where it seems to be both a ubiquitous presence and a dirty word. It’s often referred to as ‘airbrushing’, though a physical airbrushing tool is rarely used these days. Airbrushing has become a catch-all term referring to the practice of ‘touching up’ photos of celebrities and fashion models to slim figures, remove blemishes, smooth skin tone and perform a seemingly endless list of other tweaks and edits. For some, it’s as much a part of the glamour photoshoot process as make-up, posing or lighting, while for others it’s a symptom of celebrity culture, aggressive normalising of beauty standards and harmful body image, especially for women. It’s an ongoing debate that shows no signs of disappearing – just yesterday there was fresh controversy as alegedly ‘unretouched’ photos of singer Beyonce Knowles were leaked to a fan website. It has become a popular stance for celebrities and publications to declare themselves anti-retouching – when actress Cate Blanchett appeared on the cover of the Economist’s Intelligent Life magazine, it was without any digital retouching of the image at all. Last year, New Zealand singer Lorde tweeted two photos of her from the same concert, one of which had been edited to remove skin imperfections, with the caption: ‘remember flaws are ok :-)’. More recently, there was an outpouring of support on social media for model Cindy Crawford when a non-retouched image of her posing for Marie Claire was leaked online. Though the photo was initially misidentified as being part of an upcoming Marie Claire series, when it was in fact a leak from 2013, it was still notable for sparking debate on retouching and what ‘real’ women’s bodies look like. Online, many publications and communities are firmly against retouching. Feminist website Jezebel has made a name for itself in obtaining pre-edit images from photoshoots of stars and comparing them to the final product. In one notorious instance, the website paid $10,000 for allegedly unaltered images of writer and actress Lena Dunham from a Vogue shoot by Annie Leibowitz, Dunham being a personality who has arguably built much of her identity over not conforming to conventional beauty standards. However, the images received did indicate some alteration of Dunham’s face and body. There has even been some governmental kickback against photo retouching – in 2011, the UK Advertising Standards Authority banned an advert for Lancome featuring Julia Roberts, ruling that the flawless skin depicted in the image was simply too good to be true. Speaking to photographers who work in the industry, you quickly get the impression that the term ‘game-changer’ is scarcely adequate when it comes to Photoshop. Editorial, beauty and fashion photographer John Wright (www.johnwrightphoto.com) believes that the history of his profession can very much be divided into pre- and post-Photoshop. John also said that the advent of Photoshop as a tool in his industry had levelled the playing field for younger photographers, allowing those with digital skills a new way to penetrate the industry.